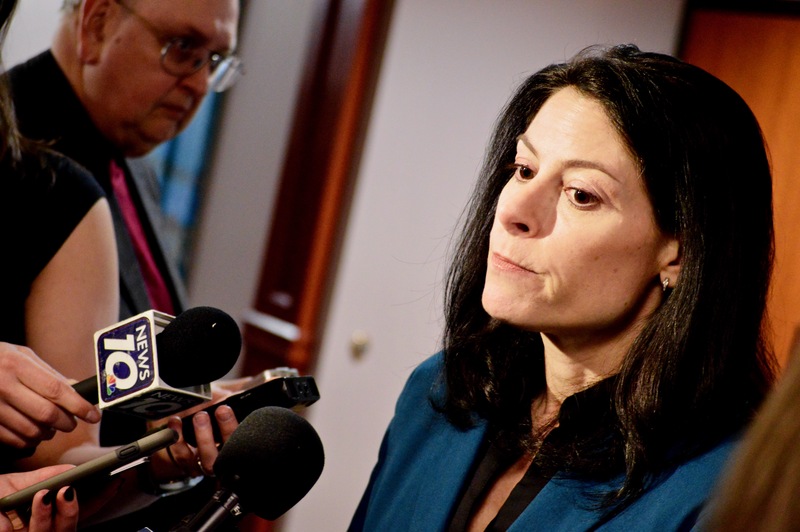 Attorney General Dana Nessel has continued the investigation into sexual abuse in the Catholic Church started by her predecessor, Republican Bill Schuette. However, the response to the Democrat has been markedly more hostile from conservatives than when Schuette began the probe. That includes state Rep. Beau LaFave* (R-Iron Mountain), who accused Nessel of “anti-Catholic discrimination,” and Michigan Republican Party spokesman Tony Zammit, who wrote an op-ed. In February, Nessel held a press conference giving updates on three big investigations involving sexual abuse at Michigan State University, the Flint water crisis and sexual abuse by Catholic clergy in Michigan. Many conservatives were outraged. Kelly Rossman-McKinney, Nessel’s communications director, said she personally received about 500 emails in response. “Some of them were respectful and polite and just expressed their concern about that phrase, but a lot about it was just vile and hateful,” she said. Nessel told the Advance that she has received many threats of violence, many of which are in response to the Catholic church investigation. Her office declined to give further details about the threats. As Nessel is both Jewish and gay, the Advance asked if those factors were raised in any calls or emails the office received. Tlaib, who was elected last year to represent the Detroit area, is one of the first Muslim women in Congress. “The stuff that I have seen — I’ve gotten roped into her Twitter feeds more than once, only because … she supports me and she put my Twitter handle it and it automatically ropes you in, too,” Nessel said. Nessel has opened up a hate crimes unit in the AG’s office to investigate the rise in incidents in recent years, according to FBI statistics. Nessel has said that Muslim and Jewish communities, in particular, harbor safety concerns after mass shootings at a Pittsburgh synagogue and New Zealand mosques. That unit also has been criticized by conservatives. Nessel said the point she made about the Catholic church’s internal investigations was critical, “whether it was artfully done or not. She said that the attorney general’s office got roughly another hundred calls from sexual abuse survivors after the news conference. Nessel said some people are “scarred for life. The AG said one of her goals is to find sponsors in the Legislature to reintroduce a bill that would prevent clergy from engaging in sexual relations with those in their congregations. This story was updated to correct the spelling of Solicitor General Fadwa Hammoud’s name.